This versatile American with the unusual last name hails from the paradise islands of Hawaii. More often his name was referred to as 'On-Gas' because of his charging driving style. He also had a rather unusual path to Grand Prix racing. Danny started his motorsports career riding motorcycles. In 1960 he took the Hawaiian Motorcycle Championship, then turning his attention to drag racing, spending the rest of the decade collecting several NHRA US National titles. 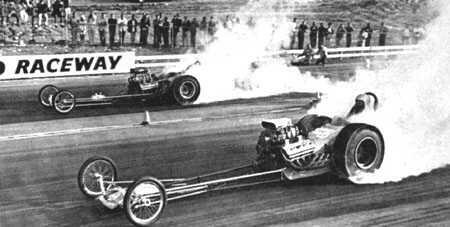 In 1965 Danny became the first driver to exceed 200mph on a European track (here you see him burn rubber at Carlsbad in 1965). He took his last US National Funny Car title in 1969. He also has the honour of being granted the NHRA Drag Racing Licence #1 in 1964. He continued in drag racing into the early seventies, but by 1974 he had taken to circuit racing and from 15 starts notched up 12 wins in the SCCA Road Racing Series. Entrepreneur Ted Field, boss of the Interscope company, noted his skills and wanted Danny to race for him in F5000. 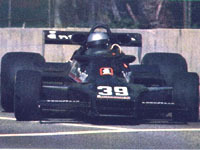 So the following two years were spent in F5000 and in 1976 Ongais earned a 5th place in the final standings. At the late age of 35 Danny's single-seater was suddenly blooming, even continuing into America's top category. 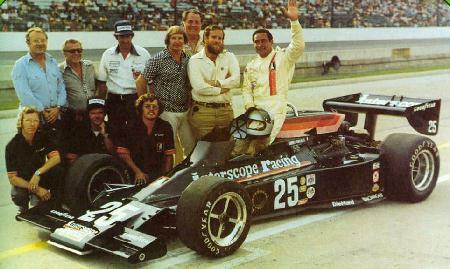 In 1977 Danny Ongais was put in a Interscope-backed Parnelli ChampCar by his teamboss Ted Field. 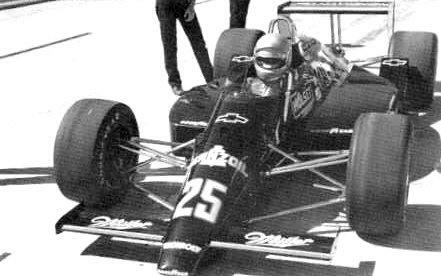 For a debuting thirty-something Ongais ran extremely well in his rookie year: at the 1977 Indy 500 he retired after 90 laps but later won the Michigan 200. Still in the same season ambitions rose even higher, Ted Field also wanting to do Formula 1. So Field went shopping and bought a Penske PC4 for Danny to drive. Ongais made his GP debut late in the 1977 season in his home race at Watkins Glen, alas retiring early on, but in the following race at Mosport he finished a fine 7th. Through this result Field and Ongais got the taste for more. In 1978 the team started the first two races in an old Ensign before Field acquired more up-to-date machinery. Unfortunately the Shadow DN9 wasn't a very developed car and here we see Danny struggling to prequalify the car. Despite his usual hard charging he was unable to get the car up to speed. His brief GP career was over almost as quick as it had started and it ended after a final attempt mid-season at Zandvoort. Now he was back in ChampCar racing with the occasional outing in the IMSA sportscar series as well. He won a ChampCar race at Mosport in 1978 and in 1979 won the Daytona 24 hour race together with Interscope boss Ted Field and Hurley Haywood in a Porsche 935. He also finished 4th at Indy in a Parnelli VPJ6. For 1980 Field boldly decided to go with a self-designed chassis. 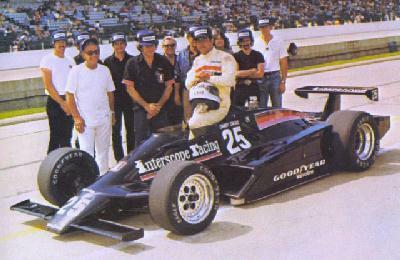 Ongais was to have driven the Porsche flat-6 single-turbo powered Interscope at Indy but Porsche withdrew when USAC moved the goalposts by reducing the German power unit's boost pressure at the last minute. The following year Ongais raced the striking "Batmobile" look-alike Interscope with Cosworth DFX power but he nearly lost his life when the suspension broke and he had one of the most destructive crashes ever seen at Indy. Danny was in critical condition and remained in intensive care for over a week. Amazingly he was back behind the wheel of a new Interscope 03 in 1982. Danny was also racing at Le Mans during the same period. In 1980 he was in a Porsche 935K3 with Ted Field and Jean-Louis Lafosse, of course with Interscope sponsorship seen on the car. 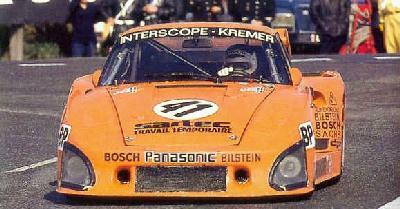 In 1982 was behind the wheel of a Kremer Porsche CK5, again driving with Ted Field, this time with Bill Whittington as third driver. These two outings didn't bring any success. He also occasionally sat in a 962 during the mid 1980s. Here we see him at the Czech Most track in 1986. He continued to drive at Indy during 1983-87 but without much success. In 1987 he did what everyone thought was his final Indy 500 but he crashed while practising his Penske PC16-Chevy. Ongais suffered a concussion and was declared medically unfit to drive for the remainder of the month. Most observers thought he was out of racing for good. 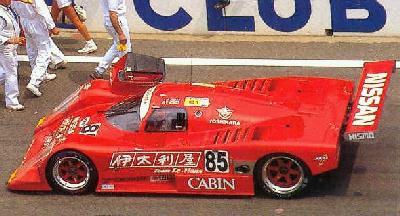 However, in 1988 Ongais was back at Le Mans this time driving for the Japanese Cabin Team Le Mans, driving a Nissan R88S together with Michel Trollé and Toshio Suzuki. Again, this outing finished with a retirement. Then with a gap of eight years, Danny was surprisingly asked to come back from retirement at the grand old age of 54, to drive at Indy for the Menard team. It happened under under tragic circumstances: pole man Scott Brayton had crashed fatally during post-qualifying practice and Danny was asked by team owner John Menard to fill in for poor Brayton. Due to the driver change Danny started from last position on the grid in the car Brayton had already qualified. This is allowed under the peculiar rules used at Indy. The ageing Hawaiian didn't disgrace himself. Far from it in fact! He finished in a creditable 7th place running only 3 laps behind the winner. This must have been like drinking from the fountain of eternal youth, for in 1998 he was back behind the wheel of an IRL Dallara-Aurora IR7 and running 215mph before crashing and being unable to qualify. That was his final day in the limelight, since his name hasn't returned on the entry lists of any of the following Indy editions.